Back in the mid-1980s, I scored major points in an elementary school science class because of the daily afternoon cartoon series, G.I. Joe: A Real American Hero. I was in the fifth or sixth grade, if memory serves, and the science teacher asked if anyone in the classroom knew what the acronym DNA actually stood for. Of course, no one did, and there was an awkward pause while the teacher waited, patiently, for someone, anyone, to answer her query. Not wanting to appear too brainy, I hesitated, but ultimately raised my hand and replied: "Deoxyribonucleic acid." How the heck did I know this at such a young age? G.I. Joe. That's right. G.I. Joe. Back before I realized that cartoons were merely thirty minute commercials for toys I would later harass my parents to purchase for me, I watched the same animated shows everyone else did, including G.I. Joe. Periodically, when the toymakers realized they needed to introduce a new line of toys, they would begin a new season of the cartoon and introduce a whole host of new characters, each with its own accompanying "action figure." And so it was with Serpentor, the new leader of the terrorist organization, Cobra, who was introduced in a five part episode entitled, "Arise, Serpentor, Arise!" This new super villain was genetically manufactured by the villainous Dr. Mindbender, who dispatched his evil forces across the globe to rob the graves of famous military leaders and tacticians so that he might create his own super military leader from their DNA. Wikipedia suggests that this was part of the second season of the G.I. Joe cartoon, which aired sometime in 1985 or 1986. (I suspect it was 1986, as both the Wikipedia entries for Serpentor and Dr. Mindbender indicate those action figures were released that year.). Pictured above is the cover of G.I. 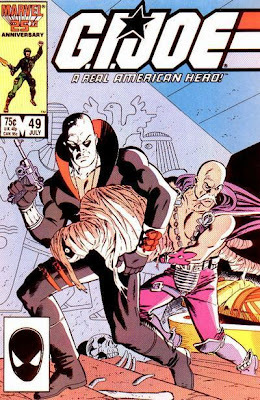 Joe #49, which depicts Destro and Dr. Mindbender making off with a corpse for this purpose. In the cartoon, Dr. Mindbender, in explaining the scheme he had hatched, specifically mentions DNA and the source of the acronym, and I remembered it, making myself look smart in class later that year. Who knew? The best part: I never had to reveal the source of my knowledge, for even then, I knew that I would have regretted that admission. I have no idea if this was my first exposure to the idea of DNA. I certainly remember breathlessly watching the non-Larry Hama penned episodes of the TV show as Cobra grabbed the DNA from great military leaders. I also thought Dr. Mindbender was a bit of an oddball. Even then I wondered what sort of doctor practices in a cape and no shirt. He was also the last GI Joe figure I believe I ever received as a gift, or who was included in my meager collection of Joes. And I remember feeling a little weird about trying to include him in anything that had to do with my GI Joe helicopter. 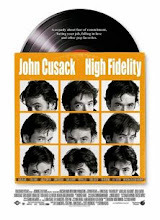 High Fidelity: The Beta Band's "The Three E.P. 's"
Daylight Savings Time Begins. Spring Forward. Ace of Base - The Ultimate Collection? Jermaine Jackson - The Ultimate Collection?